“They whom this book commemorates were numbered among those, who, at the call of King and Country, left all that was dear to them, endured hardness, faced danger, and finally passed out of the sight of men by the path of duty and self sacrifice, giving up their own lives that others might live in freedom. Alan Regin is currently undertaking research to find out more about each of the men listed, which includes finding where each of them is buried and/or commemorated and any other details that can be found along the way. Already, many ringers across the UK and beyond have been helping with this research. Of the list in the Memorial Book there are 53 individuals about whom it is proving difficult to find further information. Their names are shown in black in the alphabetical list. If anybody could add any detail, however large or small, about any of these individuals, this would be very gratefully received. Alan Regin would much appreciate it if ringers at all towers would check whether any former members are commemorated on peal boards or special memorials, in minute books or other documents that their tower may hold. This is even more important when any are NOT included in the list of names on this website because we would like to commemorate all ringers who fell in the Great War, and we will add new names to the book in the future. If anybody is able to supply any more information Alan would be very happy to receive photographs of any memorials, peals boards or even the men themselves. He already has a significant collection, including more than 860 photographs of gravestones or memorials of the men, and would be very happy to pass any of these on. It seems from the material below that in 1920 the roll consisted of a list of about 950 names. By 1923 this had grown to almost 1,100. The Memorial Book was completed and presented to the Council during the 1924 meeting. The statement at the 1929 meeting that “this book had been brought up to date” may refer to the addition of names at the ends of some existing pages, which consequently are not in alphabetical sequence. It is believed that these names brought the total number to 1077 as can be seen today in the Book itself and also shown on this website as the Main List. At the 1995 Council meeting it was agreed that 38 names from the Truro Guild should be added. This resulted in the creation of the Addendum which actually contains 36 names. The “supplement” mentioned in the minutes of the 2005 meeting presumably refers to the Second Addendum, which contains the names of 20 ringers from Kent. The inclusion of the two Addenda in the Memorial Book brought the total number of names to 1133. Work is now under way to correct and update an electronic copy of the Book entitled Great War Casualties. This is a single list in alphabetical order whose contents can also be viewed in sections by Tower within each Society represented, by Cemetery/Memorial, by Regiment or by Rank. 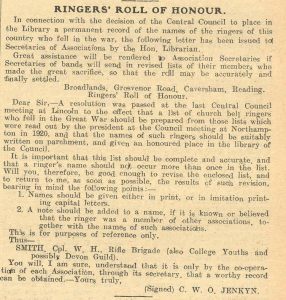 “The Council naturally wished to honour the memory of ringers who had been killed during the war, so in 1919 a start was made on collecting their names from the Associations. “When the Council met in Northampton in 1920, the members stood in their places at noon as the names of nearly a thousand ringers were read out to the sound of tolling of bells in the neighbourhood; this took nearly half an hour. “During the 1921 London meeting, the members went from Church House across to Westminster Abbey, and held a brief service round the tomb of the Unknown Soldier. The President laid on the tomb a wreath with the inscription, ” A token of deep respect from the Church Bell Ringers of England.” A course of Stedman Caters was then rung on handbells. roll now numbered about 1,100. It was for the Council to give him further instructions in the matter. After many suggestions and some discussion, it was resolved, on a motion, proposed by Mr. T. Hervey Beams, and seconded by Alderman J. S. Pritchett, that the wording of the “King’s Scroll” should be adopted as the preface, and that the names should be written in alphabetical order, followed in each case by the name of the tower and association with which the ringer had been specially connected – abbreviated where possible – and that the roll should conclude with the text, “Their name liveth for evermore.” It was not considered essential that more than the title page should be illuminated, but that the writing should be good and of a permanent character. “ROLL OF HONOUR — The Hon. Secretary stated that this book had been brought up to date (as they would observe)”. included in the First World War Roll. No other Societies had provided information. Chris Rogers seconded. if any ringer could be included, whether or not they had been a member of an affiliated society. affiliated societies. No details are on the website, but the details could be placed there without difficulty. In proposing the adoption of the report, Andrew Stubbs noted that work on the supplement was not yet complete but should be ready soon; he would bring it to the 2005 meeting. Andrew Wilby seconded. In proposing adoption of the report, Andrew Stubbs was pleased to report that the work on the supplement was now complete and available for inspection that day, prior to its return to St Paul’s Cathedral. As mentioned earlier in the meeting any decision on a further volume would be deferred until next year. Michael Church seconded and adoption of the report was agreed. In proposing adoption of the report, Andrew Stubbs noted that after the Harrogate meeting he was asked to add names to the World War I volume: if there were any others to be added, would members please notify him as soon as possible. Andrew drew attention to there being only one copy of the Rolls of very poor quality: he suggested that more copies could be microfilmed if there was sufficient interest. Laith Reynolds seconded. Are there any towers in the West Midlands who will be ringing today in support of Notre Dame and could welcome a photographer from the press association? I’m waiting for more details about what he’s looking for but would be great to know if anyone can support. If you can help, please email me cmlead@cccbr.org.uk with tower details, time of Ringing and what is being rung. If you can, please try and gather some ringers to ring at any time on Thursday in any way you & your incumbents see fit (open, half-muffled etc.) and add your performance to the BellBoard event that has been created to record the ringing: bb.ringingworld.co.uk/event.php?id=10669. These performances will then be published together in an upcoming edition of The Ringing World.